Just Shutters offer the finest selection of window shutters in Clifton and the surrounding areas. Run by husband and wife shutter experts Rob and Linda Reeves, you can be assured of the local service and unbeatable quality Just Shutters is known for. Be inspired by our stunning range of Plantation Shutters. Feel secure with our lifetime guarantee. Call us on 0117 370 1594. Whether you live in a towering townhouse or a riverside apartment, Clifton homes pack a punch when it comes to large open spaces, feature windows and a feeling of grandeur. Stunning interior shutters are the perfect way to enhance the charming original features without detracting from them. And with the UK’s largest range of materials and finishes, Just Shutters ensure your shutters are as unique as you are. Just Shutters have a hard-earned reputation for quality and service like no other; our 8000+ satisfied customers are testament to our dedication and passion for the finest plantation shutters on the market. We offer expert guidance, a fabulous choice of quality products and value to boot. With ranges to suit any budget and style, fully backed by our lifetime guarantee; we offer the very best Plantation Shutters in Clifton. 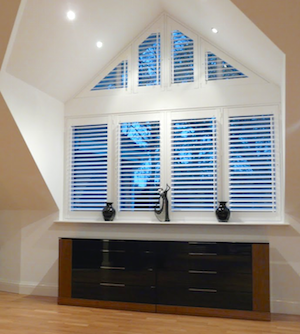 Why choose shutters for your windows and doors? – Long lasting – our lifetime guarantee speaks for itself! – Fantastic for children, pets and the older generation – no pull chords, choking hazards or trip danger. – Allergen reducing – they do not hold the dust, mites or moulds like fabrics. We would be delighted to show you how we earned our reputation, please call Rob and Linda now on 0117 370 1594 and challenge us to create the perfect plantation shutters for your home, or follow the links above. All testimonials taken from third party website Checkatrade where we have the highest percentage of 10/10 reviews in our area, rated 9.9/10 we are working hard on the 0.1! Installation of plantation shutters in Weston-Super-Mare. Install shutters office and bedroom. Shutters installed to bedroom bay window.